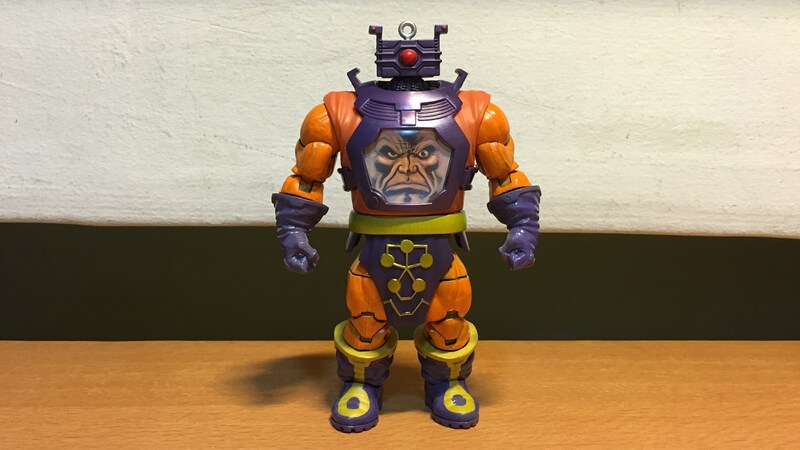 Now this is a Marvel Universe custom figure that had been a long time coming – the diabolical scientist Arnim Zola ! Arnim Zola was a biochemist in the 1930s who became one of the first genetic engineers in history after finding and decoding a cache of ancient scientific papers written by the offshoot race of humanity known as the Deviants. Arnim Zola then allied himself with the Nazis, who see Zola’s genetic experiments as a means to create super soldiers and ensure the existence of the Master Race. Arnim Zola creates a sophisticated robot body for himself and devised a method to transfer his conscious mind into the robot body, which allowed Arnim Zola to survive the end of world War II and into the modern age. Arnim Zola continues his nefarious experiments, working with likes of Hydra, the Red Skull, Baron Zemo, Baron von Strucker, all the while creating hideous monsters that do his bidding. I hinted wayback (8 years ago!) that I was planning on a custom Arnim Zola. Since then I had been searching online for various possible recipes. At one point an idea to customize an Arnim Zola from a Cobra B.A.T. was considered and ultimately discarded as I thought it looked too small. Finally I came across this recipe at Figure Realms Customs. And I felt that this particular custom seemed massive enough when compared with the other Marvel Universe scale figures. The hard part was finding the required Marvel Legends BAF parts. Again not many people are aware of this, two BAF Arnim Zola torso released – one with Arnim Zola’s human-looking face on the chest, and other came with Red Skull’s face. Similarly, two BAF Arnim Zola robot heads were also released – one with yellow eye (original Arnim Zola), the other with red eye (the Red Skull’s apparently). Apparently the Red Skull was at one time stuck in Arnim Zola’s robot body in the comics, so the Red Skull-face torso and red eye head reflects this storyline. For some reasons the ML figures with Arnim Zola-face torso, and the yellow eye robot head, were severely short-packed in their distribution, making the Red Skull versions far more common. As a result they were very hard to find on retail sale, and it also had the unfortunate effect in misleading many people into thinking that Arnim Zola has a Red Skull face on his screen! Here’s a scan of Arnim Zola’s face. It is NOT a Red Skull ! After a very long search, I was able to track down a ML Madame Masque together with the Arnim Zola-face torso at a specialty toy shop. And I bought the robot head on eBay, it was the red eye version as only that was available. But I was okay with it as Arnim Zola’s robot eye had inconsistently been either yellow or red in the comics anyway. The original hips on the BAF torso was removed and replaced with that of Thanos’. The arms and legs were painted orange, while the gloves and shoes were painted purple, with additional patterns painted on the shoes. Originally I thought it will be a simple matter of just inserting in the arms with the shoulder plugs dremeled to fit into the torso. But then I discovered that the plugs were too short to snugly fit into the BAF torso. It was only recently that I came up with a method to extend the lengths of the plugs such that the arms will not so easily drop off. The shoulder plugs were extended by attaching them each with a wooden peg. These wooden pegs are used for holding up shelves on bookshelves. The peg is first sawed to a suitable length and sanded to fit snugly into the torso. Holes are drilled on the out-facing end of the peg such that the shoulder plug can be inserted into them. Epoxy glue is then used to fix the pegs and shoulder plugs in place such that they move as one without breaking. And with the shoulders issue finally settled I was able to declare my custom Arnim Zola as complete. Arnim Zola and his partners in terror – Red Skull, and Baron Zemo. Arnim Zola sends the Nazi super soldiers to fight Captain America – Master Man and Warrior Woman ! Yeah, Zola sometimes does that with his ESP box.